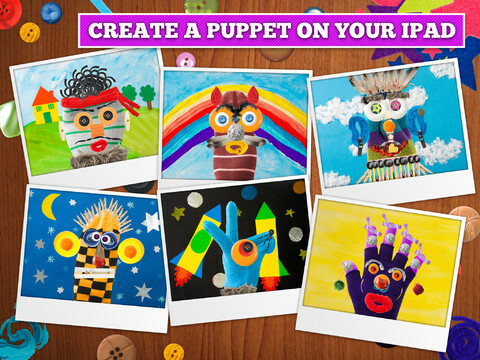 Puppet Workshop lets kids make their own hand puppet on the iPad. Pretty cool, huh? We thought so too, because it’s our Free App of the Day. Puppet Workshop was created to develop your child’s creativity. Choose a sock or glove which will become a virtual puppet. Create the eyes, nose, mouth and hair using a variety of buttons, strands, ornaments, etc. Place the puppet on the background available in the app or upload your own background from camera roll on your iPad. Alternatively, your child may use some paper, markers, crayons and independently create his or her own background that you can use in Puppet Workshop. Do you like this game? Easy as 1-2-3 – use any socks, buttons, threads that you can find at home and create your own hand puppets. Put them on your hands, play different roles and have a lot of fun. ● this app does not collect or share any user’s personal information. ● this app contains “More Apps” external links on a separate page accessible through a “press and hold” button. The links to the apps are accessible by “double tap” buttons. We would like to know what is your opinion about Puppet Workshop. Does your child like this application? What needs to be improved or added? It’s very important for us to create useful apps for kids, but in order to do so we really need your support. If you like the application, please share your thoughts on our work with others – write a review of the app and rate it in App Store. It only takes a moment for you, but it is very important to us. *Free Kids App of the Day is on ongoing series on iPadKids where we hand select a free app to be featured every day. We can only guarantee that the app was free at the time of publishing, so get in quick so you don’t miss out!